Whoever said numbers never lie did not watch much hockey. 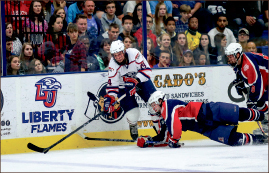 Liberty University men’s division I (DI) hockey (5-0-2) and the University of Arizona (2-1-0) proved that this weekend, Oct. 3-4 in a 1-1 series split in which play transcended the scoreboard. The Flames 8-0 game one win, for example, skewed the storyline to that of a Flames dominance. In reality, the tempo was fast right off the first puck drop. Sophomore goalie Matt Pinel stole Arizona’s scoring chances, battling to stop every one of the Wildcats 32 shots on goal for a commanding shutout. Friday’s starting forward line of Bram Erickson, Grant Garvin and Ryley Egan led the charge, throwing pucks on net and defensemen into the boards in a breakout offensive showing. “(The coaches) were talking about them just this week a little bit,” Head Coach Kirk Handy said of the line. “They’re three talented players who have been playing well and just haven’t been getting the breaks. Garvin scored just over a minute into the game on an assist from Egan, who found the back of the net himself just minutes later with some help from defenseman Chase Harris. Before the end of the period, Garvin got his second goal — this time, assisted by Erickson and captain Matt Sherry. “I think it’s just starting to click now that we’ve been playing with each other for a while,” Egan said of his line’s chemistry. Luke Hannon and Luke Simon each netted a goal in the second period off crisp passes from linemate Lindsay LeBlanc. In the third period, Sherry put one away, assisted by Erickson and Harris. Kyle Garcia scored unassisted, and in a final burst, Egan put his second in the net on Erickson’s third assist of the evening. And they made them. The Flames won just under 58 percent of their faceoffs and sat just seven times. But, once again, the scoreboard told a different story. The Wildcats won the game 6-5 in a shootout despite another concerted Flames effort. After the rough nature of the previous night’s game, both teams’ play was less sharp. While Liberty decreased its penalty minutes, Arizona was more advantageous netting four power-play goals. period. But Arizona responded with poise, netting three goals in the third — two on power plays — to send the game to overtime. After a scoreless extra period, the Wildcats bested the Flames 2-1 in a shootout to secure the win. Considering that the team did, statistically speaking, play smarter Saturday than Friday, though, the loss seemed extra tough to swallow. While coaches and players alike took full responsibility for the outcome of the game, the calls on both ends of the ice seemed spotty at times, and the refs waved off an early Flames goal that would have changed the outcome of the game. While the scoreboard did not show it, the Flames improvement throughout the weekend says their frustration will be put to good use in next weekend’s matchup with Minot State University. Liberty will travel to take on the Beavers both Friday and Saturday, Oct. 10 and 11 at 7 p.m.